Carpetgrass (Axonopus fissifolius [Raddi] Kuhlm.) is a common perennial warm-season turfgrass grown in Louisiana. It is best suited for areas with wet, acidic soil. In general, it’s a low-maintenance turfgrass; however, because of the prolific seedheads production, it may require more frequent mowing to be more aesthetically pleasing. Its leaves closely resemble centipedegrass and St. Augustinegrass, but carpetgrass can be distinguished by its seed heads. If carpetgrass is found growing unwanted in a lawn, it is treated as a perennial weed. 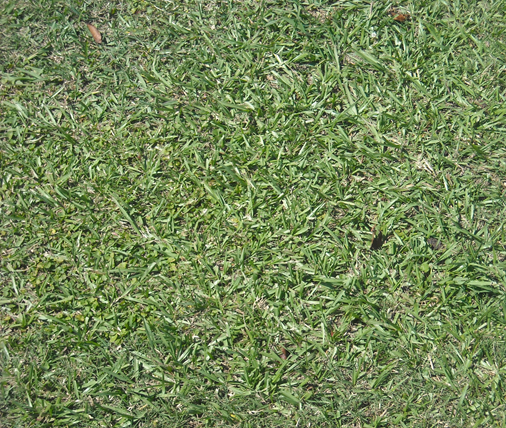 Carpetgrass is a coarse-textured turfgrass with light-to-medium green leaves. Leaves are alternately arranged on the stem and have a narrow, rounded tip. Its seed head has multiple slender spikes (stems of flowers), which are typically arranged with two spikes forming a V shape and the third spike extending just below the base of the V perpendicular to the stem; however, the third spike is not always present. Carpetgrass produces stolons (aboveground stems), which allows it to spread laterally. HINT: Carpetgrass can be confused with centipedegrass and St. Augustine grass. Note that carpetgrass has a tall seed head with multiple spikes compared to the singular seed heads of centipedegrass and St. Augustine grass. Soil Type: Grows in a range of soil types but prefers high-moisture areas compared to other commonly grown turfgrasses. Soil pH: Prefers acidic (< pH 7) soils. Always follow soil test recommendations to achieve desired soil pH. Light: Performs best in full-sun areas but can tolerate partially shade. Growth Rate: Rate of growth is moderate; spreads via stolons. Tip: Before amending the soil, consider testing your soil at the LSU AgCenter Soil Testing and Plant Analysis Lab. Visit http://www.lsuagcenter.com/portals/our_offices/dep... or contact your local extension office for more information. Mowing and Traffic: Mow at 1 to 2 inches routinely during the growing season. Never remove more than one-third of the leaf blade height at one mowing. Mowing at the appropriate height is key in preventing scalping and reducing weed encroachment. 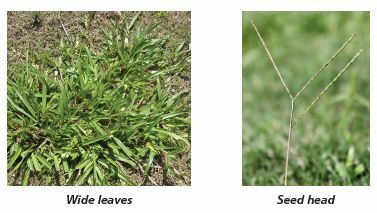 Carpetgrass produces unsightly seed heads, adjust mowing frequency as desired. Fertilization: Fertilize with up to 1 pound of nitrogen per 1,000 square feet per year. Fertilizer should be applied from midspring to midsummer. Never apply more than 1 pound of nitrogen per 1,000 square feet per application. Follow soil test recommendations for proper fertility. Irrigation: Naturally occurring rainfall may provide sufficient water for maintaining a healthy turfgrass in normal years, but irrigation may need to be applied to prevent plant water stress during drought periods. Dethatching and Aeration: Thatch does not typically develop in carpetgrass. Compaction can form more quickly on finer-textured soils and in areas where there is high traffic. Aeration needs to be performed in late spring to summer when the turfgrass is actively growing. Establishing carpetgrass in the lawn can be achieved via seeds or plugs. In Louisiana carpetgrass is most commonly established through seeding. Seed: Select and purchase your desired seed and follow the manufacturer’s labeled directions for the rate of seed per area. Rake seeds into a smooth soil surface and keep watered until germination and throughout establishment. Plugs: Purchase plugs or create plugs from an existing area. Plugs should be planted about 1 foot apart. Irrigate, fertilize and apply weed control as necessary until established.